Finally I had the chance to taste what it's like to spread mango chutney on toasted bread and it is sure heaven on earth. 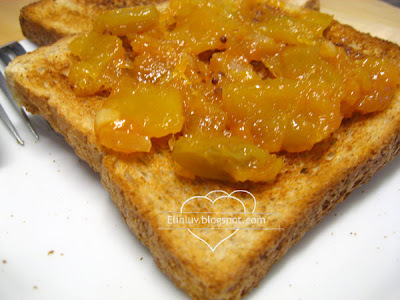 I remembered Angie of Angie's Recipes , commented on my homemade chutney post that she would like to have a chunk of this mango chutney on her slice of bread. And I have been wanting to try it out but it has slipped my mind till tonite . And truly it was good. I made this mango chutney a month or two ago and it still tasted just as good as I had made it the first day...so it proved that mango chutney can keep for a few months in the refrigerator if it is well cooked. The sugar acts as a preservative! 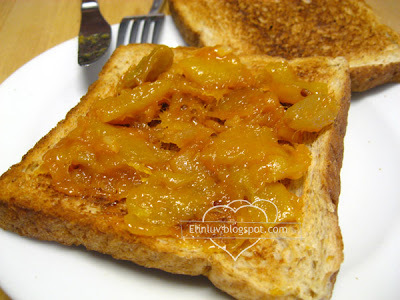 I had quite a heavy lunch today so I thought I will have a light dinner...mango chutney on toast :) yummilicious and it tasted better than having mango jam! Haven't tried mango chutney before. Sounds and looks really yummy on toast! I want some too! 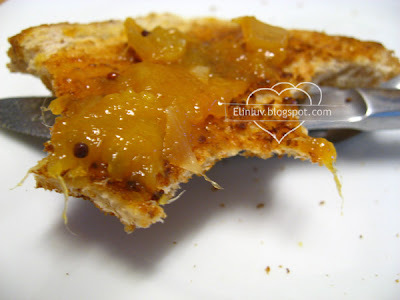 Elin, your mango chutney on toast are a heavenly breakfast treat! Next time I'll know how to make use of this chutney, as a spread. I've a friend who will give me this whenever it's mango season, because she's got a huge mango tree in her garden. I once followed a quick-pickling recipe that claimed the pickles would go bad in a week. 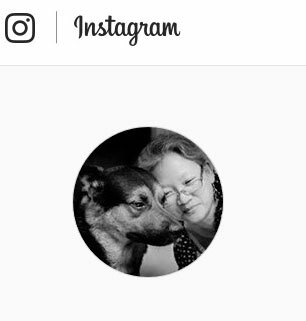 I was like, come on, a week? Really?? They're smothered in vinegar! Some people are really timid about anything that doesn't have a seal on it. Good for you, keeping your chutney around until it actually physically goes bad. Looks yummy on the toast! What a lovely, simple snack! 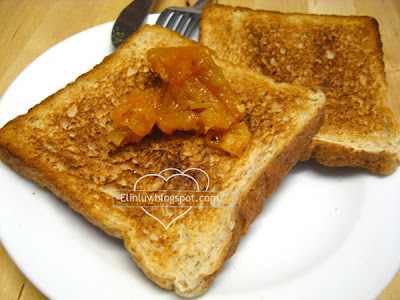 @ Little Inbox: It is aromatic and served well as a spread for toasted bread slices...yummy! 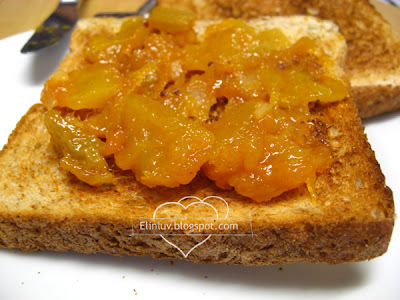 @ Angie's Recipes : Hi Angie, thanks for the idea and it is really wonderful as a spread on bread!